Turn the engine switch off and ensure that all the doors and windows are closed. 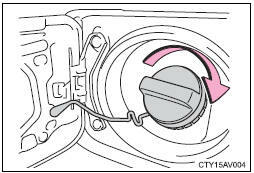 Turn the “ENGINE START STOP” switch off and ensure that all the doors and windows are closed. 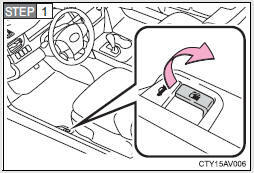 Pull up the opener to open the fuel filler door. Turn the fuel tank cap slowly to open. Hang the fuel tank cap on the back of the fuel filler door. ■When refueling the vehicle Observe the following precautions while refueling the vehicle. Failure to do so may result in death or serious injury. ●After exiting the vehicle and before opening the fuel door, touch an unpainted metal surface to discharge any static electricity. It is important to discharge static electricity before refueling because sparks resulting from static electricity can cause fuel vapors to ignite while refueling. 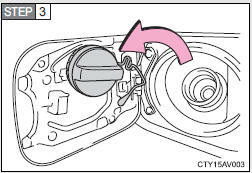 ●Always hold the grips on the fuel tank cap and turn it slowly to remove it. A whooshing sound may be heard when the fuel tank cap is loosened. Wait until the sound cannot be heard before fully removing the cap. In hot weather, pressurized fuel may spray out the filler neck and cause injury. ●Do not allow anyone that has not discharged static electricity from their body to come close to an open fuel tank. ●Do not inhale vaporized fuel. Fuel contains substances that are harmful if inhaled. ●Do not smoke while refueling the vehicle. Doing so may cause the fuel to ignite and cause a fire. ●Do not return to the vehicle or touch any person or object that is statically charged. This may cause static electricity to build up, resulting in a possible ignition hazard. Securely insert the fuel nozzle into the fuel filler neck. If fuel is added with the nozzle slightly lifted away from the fuel filler neck, the automatic shut off function may not operate, resulting in fuel overflowing from the tank. 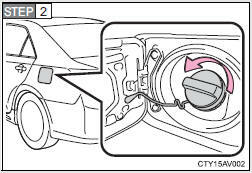 ■When replacing the fuel cap Do not use anything but a genuine Toyota fuel tank cap designed for your vehicle. Doing so may cause a fire or other incident which may result in death or serious injury. Do not spill fuel during refueling. Doing so may damage the vehicle, such as causing the exhaust systems to operate abnormally or damaging fuel system components or the vehicle's painted surface.